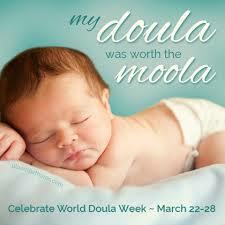 March 22nd – 28th is World Doula Week! Happy WDW to all my fellow doulas. If you had a doula for your birth, tell someone how she helped you this week. Spread the word about doulas and the good they do! This entry was posted in birth support, doula services and tagged doula, labour support by Heather Neville. Bookmark the permalink.